I have more than just a moist homemade lemon cake recipe from scratch, check out more cake recipes from scratch at the end of the page. This is homemade lemon cake is a beauty. I also include my homemade lemon butter cream frosting (and lemon cream cheese frosting) that makes this moist cake even better. Heaven on a fork. PREHEAT oven to 350 degrees. Grease and flour three 9 inch round pans, lining the bottom with parchment paper if desired. Beat 2 cups white sugar and butter until light and fluffy; approximately 5 minutes. With mixer on medium speed, add eggs, one at a time, with the lemon zest. Sift together, flour, baking powder, baking soda and salt into a bowl. In another bowl, combine 1/4 cup lemon juice, buttermilk and vanilla extract. Alternate adding the flour and buttermilk mixtures to the batter – starting and ending with the flour mixture. Fill the pans half full at the most and spread the tops evenly. Bake for 20-22 minutes or until toothpick inserted in the center comes out clean. Allow to cool in pans on wire racks for 15 minutes. Meanwhile combine the remaining 1/2 cup white sugar and 1/2 cup lemon juice in a small saucepan, cooking over low heat until the sugar dissolves. Remove cakes and set over wire rack on a baking sheet (best to sit upside down on rack, so the syrup is spooned onto the bottom of the cakes - it absorbs better). Pour syrup on warm cake (not hot) then allow cakes to cool completely. Turn over on your serving platter. For the glaze, combine powdered sugar and lemon juice in a small bowl and mix with a whisk until smooth. Pour over the tops of the cooled cakes and let drizzle down the center. Garnish with lemon slices. 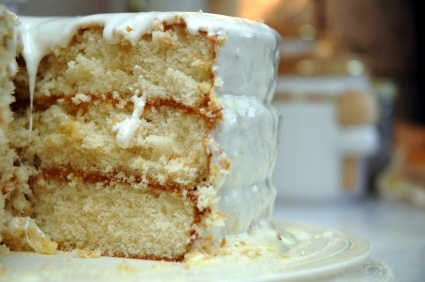 Here's the Lemon Cream Cheese Frosting recipe used with this lemon cake recipe. In a large bowl, beat the sifted powdered sugar and cream cheese until smooth. Fold in whipped cream. In a small bowl, beat the lemon pudding mix and milk for 2 minutes with an electric mixer on low speed; stir in 1 tablespoon finely shredded lemon zest. Fold the pudding into the cream cheese mixture and frost cooled cake. Includes lemon selection and tips on juicing, zesting and storage. Lemon Meringue Pie, Lemon Meringue (Ice Cream) Pie, Lemon Poke Cake, Lemon Sauce (Savory), Lemon Fruit Sauce (Sweet), Homemade Limoncello, Lemon Drop Martinis, Lemon Ice Cream, Lemon Whip Dessert, Lemon Bars, Lemon Cheesecake, Lemon Chiffon Salad, Lemon Chicken, Lemon Shrimp with Angel Hair Pasta.